In the first part of this series, Brumby Mode was introduced and examples given of why the All Blacks need to wise up to this tactic. While Brumby Mode is effective, and ideal for wet weather conditions, teams can wise up to it and number on the fringes in greater detail. This is not how the All Blacks usually play, and such contingencies would open up space out wide. However, it’s always important to vary your game and have Plan A through to Plan H if necessary. Particularly against the All Blacks. The All Blacks rush 10 triangle defence is designed to pressure the first receiver, with the rest of the line sitting back dependent on the play. The result is a triangle running at the 10 channel. The drift portion, depending on numbers, have the choice of either moving up to the line once the ball comes outside 10, or drifting to push the play down towards the touchline. In theory, this is excellent for play off 9 and, aside from Brumby Mode, is very workable to pressure the first forward pod and cut out wide options. However, there is potential for a disconnect in this system where the shoot meets the drift portion. This is best described as the three men making up the points of a triangle. A split here is highly likely. Due to the speed of the last shooter, a gap can be created that can be susceptible to a hard runner off the 10 and general manipulation around this area. If you have players 1-2-3 in a flat line, the gaps can be small. If we can draw player two forward, which the triangle defence naturally allows, you’re exploiting a gap between 1 and 3. This gap is inherently larger and more likely for line breaks. Due to the triangle nature of this point, it means a first receiver can manipulate the defence so his runners can target one of two channels. In this example, I will show two methods of doing so, for either to work, however, the 10 must, play flat to the line. The 10 can commit the inside of the shoot portion, which is usually comprised of three players (yellow). The 10 then passes flat to a strike runner already going through the gap on the inside of the last shooter. This leaves no time for the defence to react, as the angle of the triangle allows the 10 to pass to a player already through the line – as you will see in these Lions stills and a video further down. …allowing Jamie George through the already sizeable gap. The 10 can commit the last shooter (final yellow), and short flat pass to the strike runner. This runner will be running a hard inside line to target the sizeable split in-between the shoot-drift gap indicated by yellow-red. This inside line helps to create space between himself and the first drift defender once through the line – as you will see in the Ireland video. There are countless variations and plays that could exploit these two channels. The purpose of these methods is to show the vulnerability located here. 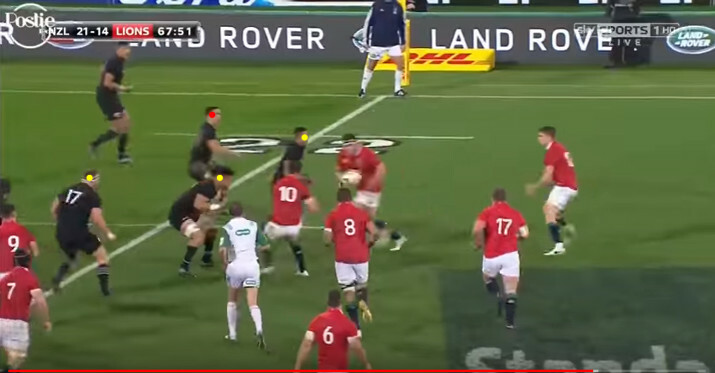 Below, you can see how easily the gap forms in the All Blacks rush defence. It’s incredibly silly to think a Kiwi team haven’t exploited this point. This is a great example of the second method and, as will be explained later, all the small parts needed for this point to be successfully exploited, are executed brilliantly. They scored their second try off set piece exploiting this exact point again, but this is a great example of why attention to detail is so important. Breaking a play down into all its lines, timings, alignments, and changing a little bit in each one so it’s a little bit better, can be the difference between the play’s success and failure. It all adds up. 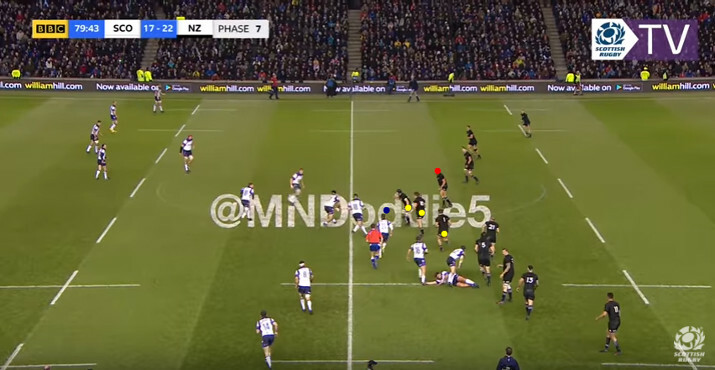 From Loni Uhila committing the pointman’s inside shoulder to his flat pass to Mark Abbott tracking his run ever so slightly outwards at the last second to draw the drift portion and increase the shoot-drift gap, to Beuden Barrett’s line, speed and flatness of his take. Great try, great execution and great coaching. Lancaster identified this back as early as 2014, probably by our very own Nick Bishop no less! England attempted to exploit it, however, while they got some success, with more focus on off the ball work like the Hurricanes, it could’ve been more effective. Whilst the pop pass worked the off the ball, work wasn’t as good in comparison to the Hurricanes. The lines run by Ben Morgan on the inside and Mike Brown’s screen were run with no intent to receive the ball in comparison to Wood. Wood’s line was so intently run in comparison to the others, that a screen pass to Brown would’ve yielded a break. Brodie Retallick should have been kept wide for fear of Brown, instead, he chose to step back in to tackle Tom Wood, as Brown was near jogging. Morgan was offside to Rob Webber (the second receiver). Therefore, Owen Franks didn’t worry about him and moved to close the space intended for Wood. These little mistakes telegraphed Wood as the strike runner. With a little adjustment on their lines, Franks and Retallick are held, and Wood goes through. England again did this in their recent match against the All Blacks. Sam Underhill and Kyle Sinckler in particular used it within the three pod superbly, and it shows how the structure can be targeted. This for me, is taken straight from the Joe Schmidt playbook. As described earlier, in the first method, the shooter runs up and Sexton commits the inside of the shooter portion. The ball is then passed to Jamie George when he is running through the inside of the last shooter. 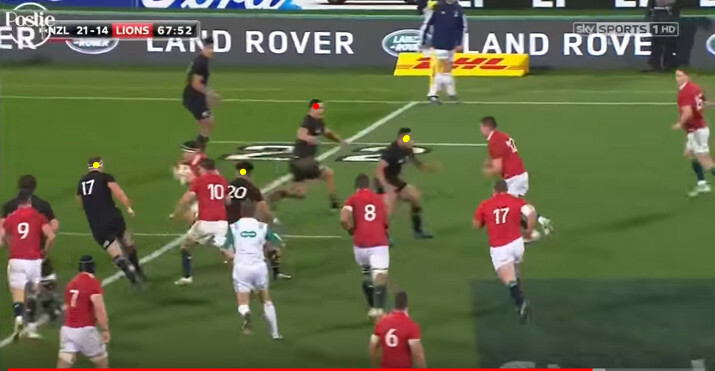 As Ngani Laumape has actually rushed up past George when he receives the pass due to the triangle formed from the shoot-drift gap, with Farrell’s screen option also interesting Laumape more. Jonathan Sexton knew about this weakness having performed it previously in Chicago as will be seen next. But it was not performed to the frequency it was there. An oddity, as this proved highly effective. On top of this, from this break came opportunity. Conor Murray scored one phase after this with a simple pick and go. Knowing the All Black weakness around the fringes, he used this whilst they were still organising and attacked where it would hurt the most. The Irish 9 and 10 attacked two weaknesses over two phases. The result? The Lions were back in the game and back in the series. This leads nicely to one of the heroes! England are not the only ones to have noticed this. Joe Schmidt’s Ireland and their game, particularly in Chicago 2016, was varied to target this dog-leg. They introduced a new dynamic in their game solely to exploit it that differed from their normal patterns. Even when the triangle push was not as strong. In this case, unlike the Lions example, they used the second method, with Sexton targeting the last shooter, and his strike runner hitting the shoot-drift gap rather than inside. But it again shows how vulnerable this area is to a gap being created. As we’ve discussed before, all defences have a weakness. One defensive system cannot cover all the bases, including the vaunted Andy Farrell Defence. This disconnect is a target and a huge weakness for teams with power and pace to target. What makes it even more dangerous are flat playing 10’s who can commit the shooter portion correctly. George Ford plays flat for England, Sexton can do it for Ireland. Does your team have a 10 that can comfortably play that flat? If so, will they exploit this weakness? Again, a perfect example of how flat play can exploit this gap. The result? This is not the only time the Pumas used this – a line break of one of the runs was crucial to a Pumas try. This combined two weaknesses, the shoot-drift gap, and the All Black numbering process on the Blindside. The next article in this series. But as we could see, its resulted in some pretty nice breaks, and seems to be a more and more common play as teams adapt to it. The distributor playing flat to the inside shoulder of the relevant defender. The strike runner must run a hard line receiving the ball flat, and targeting either one of the two channels. It must be a hard inside line if the second method is used. A screen option behind, or an alternate option outside, the strike runner to interest the last shooter or first drift defender, increasing space for the hard line. All of these are imperative. We saw the difference between Sexton passing deep and passing flat. Both lines were run on an inside angle. No difference there. The difference was in the alignment. The actual breaks in the Irish and Lions options both had screen options operating behind the strike runner. This presented multiple options to interest the first drift defender or last shooter, meaning he stood wider to help the cover on the outside options, increasing the split gap. With the Hurricanes, it was Abbott and his crab run that drew the attention of the drift defender. Again; intentional, off the ball work, making this point even more dangerous to the All Blacks. Of course, there’s other ways to target this gap. A team will need to create countless variations to target the shooter-drift gap in this pattern of defence. One in 1999 was particularly beautiful. This is near tailor-made for this defence. The Rod MacQueen Wallaby X move. The two first receivers run lines against the point and along the shooter portion of the defensive push, attracting the attention of the point player and the man inside. Splitting the defence and creating the gap for the second receiver scissors play. Not to mind a teensy bit of NFL style shepherding. A bit of a wish to see it again at this level, but a man can dream.